RALEIGH, NC--(Marketwire - Sep 11, 2012) - Bringing a fresh new twist to the way food is served at one of the premier restaurants in downtown Raleigh, NC, three new associates are spearheading the drive to serve fresh and wholesome produce at the stylish Posta Tuscan Grille, located inside the Raleigh Marriott City Center. Literally wheeling fresh produce through the front door of the prestigious Marriott hotel, Mark Butcher, new Director of Operations; Jacqueline Hyatt, who was recently dubbed as General Manager of the inviting Italian eatery, and Michael Durgerian, new Executive Chef, are taking advantage of the weekly farmer's market held just across the street to transform the Posta Tuscan Grille into a restaurant renowned for locally-sourced, farm-to-table ingredients. Selecting seasonal favorites from local producers, this Raleigh, NC luxury hotel's signature restaurant now features new food and drink menus portraying the change. In the culmination of more than 30 years' experience with the Marriott and affiliated hotel brands, Butcher took over as Director of Operations in June. Noted for attaining successful results in the area of food and beverage he has spent the past 13 years as Director of Food and Beverage at prominent Atlanta, Louisville, Miami and Ponte Verda Beach hotels and resorts. Focusing on superior customer service and dedicated to providing unparalleled profit margins, Butcher's involvement with changes at the Posta Tuscan Grille is just one of the management directives he has undertaken since named to the position. Although a newcomer to the Marriott brand, Hyatt has been actively involved in food and beverage and hotel operations management since 2006 and specializes in team building, training and staff development. Her duties at this popular downtown Raleigh restaurant include overseeing in-room dining, private events, dining room and bar operations as well as being responsible for implementing social media. With a full range of managerial skills and more than 30 years of experience in his chef's coat, Durgerian brings to the Posta Tuscan Grille the ability to supervise and train employees as well as an exceptional ability to plan a variety of menus to meet the needs of nearly any occasion. Coupling his personnel experience with a vast background in food preparation and catering, Chef Durgerian will be overseeing restaurant menus and food services at the Marriott. Combining their skills like the finest ingredients, these new associates are dedicated to incorporating the attributes of local products into delicious entrées. From seasonal root vegetables and crisp greens to fresh buffalo milk and vine ripened berries, the flavorful mystique of North Carolina's rich countryside is served up daily in tantalizing breakfast, lunch and dinner entrées thanks to their leadership and vision as well as the daily support received through devoted efforts of Raleigh Marriott City Center associates. Open daily from 6:30 a.m. to 10:30 p.m., this Raleigh luxury hotel's downtown restaurant's wholesome Italian cuisine, warm atmosphere and exceptional service team up nicely to create an ideal gathering spot, perfect for a family dinner, friends' night out or meeting up with business associates over breakfast, lunch or dinner. The Raleigh Marriott City Center welcomes guests to the heart of Raleigh with spacious guest rooms, meticulous event space and renowned Marriott service. 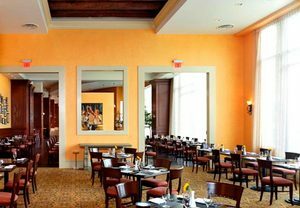 Conveniently connected to the Raleigh Convention Center and near many popular attractions and destinations, the hotel is an ideal choice whether traveling with the family or for business. Those looking to host an impressive Raleigh event will find 15,000 square feet of remarkable event space, dedicated event managers and professional catering services perfect for ensuring an inspirational and successful event. Literally wheeling fresh produce through the front door of the Marriott hotel, Mark Butcher, new Director of Operations; Jacqueline Hyatt, General Manager, and Michael Durgerian, new Executive Chef, are taking advantage of the weekly farmer's market held just across the street to transform the Posta Tuscan Grille into a restaurant renowned for locally-sourced, farm-to-table ingredients.